In my profession of insurance claims, I am naturally pessimistic. The latest report of a substantial snow event for the Pacific Northwest makes me believe no such event will occur. But, as a claim professional, I am typically cautious, and to be on the safe side, I am providing possible damages that might result from the hopeful non-existent winter storm – and possible insurance recovery options for consideration. Many will remember the December 1996 snow storm that affected the Puget Sound. That snow event was followed by heavy rains, which caused over 8 inches of snow to melt and collect on roofs. The combined weight of the melted snow and rain caused many building roofs to collapse. Reports from 1997 place the amount of damage at over $57 million in King County. It appears, based on current weather reports, the collapse potential is not as severe with this snow event. The snow is forecast to be followed by cold temperatures, and not rain as in 1996. However, predictions of additional snow, next week, could increase weight pressures on area roofs. Also, when the temperatures do warm, there are possibilities that tears in the roof membrane from the snow weight could cause interior water damage. Should snow accumulations be as predicted, consultation with building engineers may be prudent for building owners to determine the live load or snow load capacity of their buildings. If needed, safe efforts should be made to remove snow from flat roofs, ensuring that the removal does not cause damage to the roof itself. It would be prudent to consult with essential business partners to ensure they have business continuity plans in place, should their property be affected by the snow – allowing you to create alternative scenarios to maintain your business. If there is damage to your partner, CBI coverage provides business interruption to your business due to storm damage to critical customers’, vendors’ or suppliers’ premises. Business interruption due to the inability of employees, customers or supplies to reach your premises may be covered by the ingress/egress portions of your business policy. The inability to access the premises will usually require physical damage that is covered by your property policy. For example, if heavy snow load causes a power line or large trees to snap crossing the roadway restricting access to your property – the inability for access and the resulting loss of business could be covered under the ingress/egress coverage. Similarly, Civil Authority could cover the loss of business as a result of a municipality or state agency declaring inaccessibility to your business, such as a road closure for public safety due to snow and ice. The insurance policy will often require the civil authority declaration to be within a certain radius of your business; thus it is prudent to consult your local authority’s website for periodic updates on current declarations. Loss of business due to physical damage from lack of power, water, and communication resulting from damage to non-owned utilities could be covered by the off premises service interruption coverage. Off premises service interruption coverage will usually have a waiting period before coverage would be provided, but if the snow event is as widespread as predicted, it may take utilities some time to get services back to customers. Also, the roads will be icy. 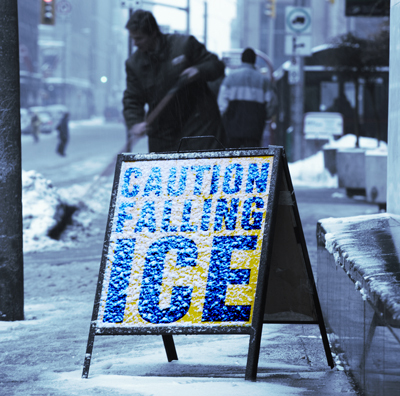 We have already experienced high auto claims volumes from the Super Bowl snow event. It might be prudent to ensure your fleet vehicles have the most updated insurance and contact information for accident reporting – just in case. I hope the predicted storm does not materialize in property damage or injuries and my naysayer view prove true. But, if the storm does bring damage to your property, please remember Parker, Smith & Feek is here to assist you through the claim process.